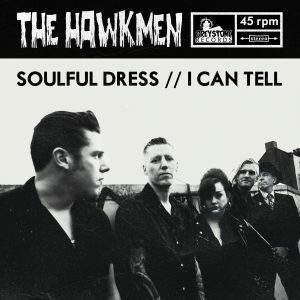 Following five original singles of blistering ‘hotrod n soul’, The Hawkmen now turn their attentions to a brace of early sixties rnb classics. A-side, Soulful Dress, is a dancefloor heater that sees the Sugar Pie DeSanto stomper saucily re-clothed in pounding double bass and piano rhythms while the guitar-led rawness of Johnny Kidd’s I Can Tell is re-versioned into a scorching organ-drenched soul groover. And you know what that means don’t you? That’s right – it means you are going to the party, you’re going have some fun – hell – you are gonna shake and shout until the morning come!